Konark - The Heritage of Mankind - Ghumakkar - Inspiring travel experiences. 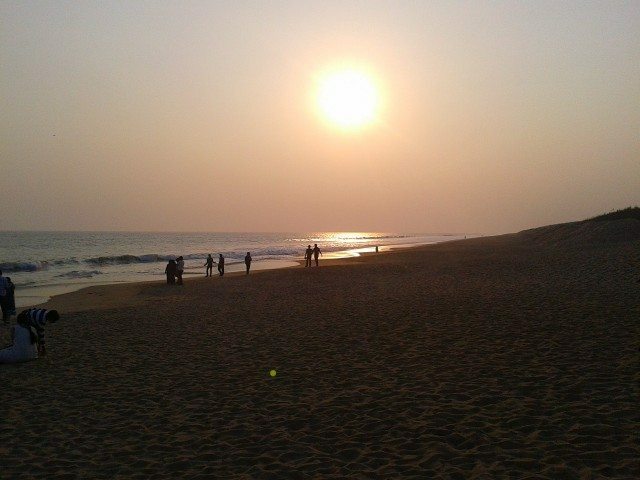 1530 Hrs – We reached Konark and were very hungry. So we decided to take lunch at the restaurant at the car parking area. There is one problem at visiting Sun temple. Except Auto or some VIP four wheelers, other vehicles are not allowed in the vicinity of Sun temple. We finished our Lunch and took an auto from the Car parking area to Konark Sun Temple. The Auto person charged us Rs 40/-. 1600 Hrs – We entered at the Temple premises. There were many guides available to explain the details of the temple. The guide rates were also fixed, so no cheating business for hiring guide. We didn’t hire guide as before coming we already read a lot on all these places. But we realized our mistake lately as we saw guides explaining very nicely and clearly mentioning details on the construction of the temple .We purchased ticket from the ticket counter and moved further to see the magnificent structure. 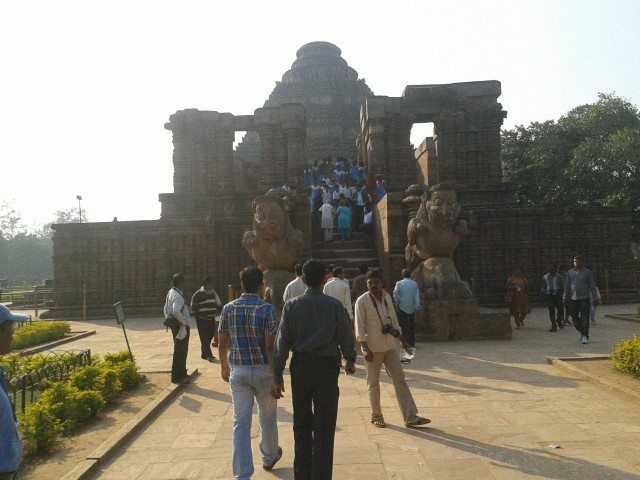 Konark Temple – Konark Sun Temple is a 13th century Sun Temple (also known as the Black Pagoda), at Konark, in Odisha. It was constructed from oxidized and weathered ferruginous sandstone by King Narasimhadeva I (1238-1250 CE) of the Eastern Ganga Dynasty. The temple is an example of Orissan architecture of Ganga dynasty. The temple is one of the most renowned temples in India and is a World Heritage Site. It is one of the Seven Wonders of India (as per the poll collected by NDTV). Legend has it that the temple was constructed by Samba, the son of Lord Krishna. It is said that Samba was afflicted by leprosy, brought about by his father’s curse on him. After 12 years of penance, he was cured by Surya, the Sun God, in whose honour he built the magnificent Konark Sun Temple. After walking for almost 02 minute’s pathway, we entered inside the temple boundaries (Where our tickets got checked).The first structure right in front of us was Natya Mandir. The entrance to Nata Mandir has a huge lion statue on both sides. If we see these statues by going closer to it we will found that it is not the statue of just a lion. 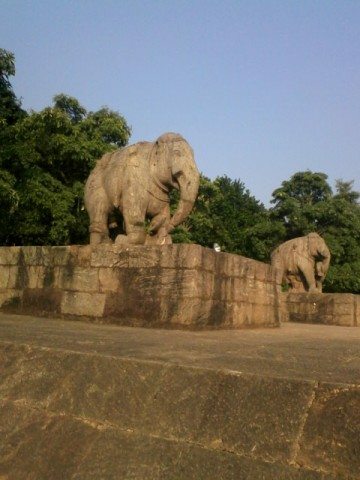 It is a giant lion over elephant and under elephant foot is a human body. The entire statue is in one stone. It is of 8’4” length, 4’9” breadth and 9’2” in height. Very beautiful statues and it was a good start for us that we should see the temple in detail. 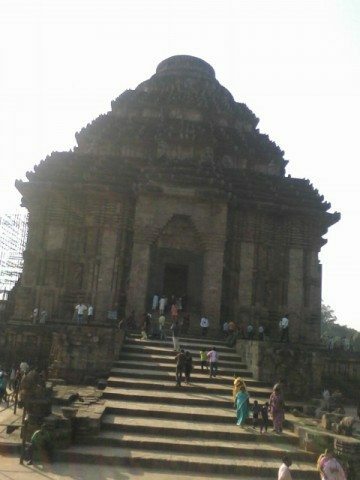 After climbing up at Natya Mandapam and then climbing down from its elevated area we saw beautiful Konark temple in front of us. As lots of restoration work is carried on at this temple, three of its sides were covered with massive iron scaffolding. Thus one can see the temple either from Ground level or just a front face at the first level. It was mentioned at the first floor that as the temple was getting damaged; the inside of the temple is filled with stones so that it can stand for more and more decades. On the three sides of Temple three forms of Sun god idols are placed. The southern side GOD called “Mitra” described as the rising Sun. It is 8’3” in height. 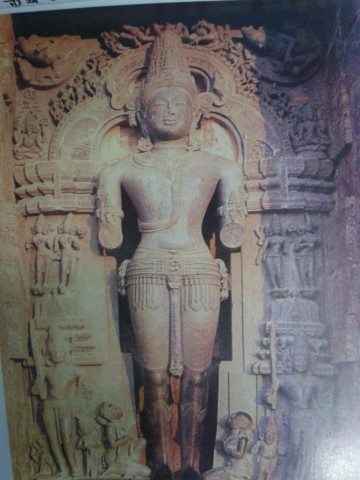 The western side GOD is called “PUNSAN” and described as mid day Sun, it is 9’6” in height. The northern side GOD is called “ Haritasva” described as setting sun, it 3.58 meters in height which is approximately above 10’. Next we saw the most famous wheels of the temple. The Sun temple was constructed as Chariot of Sun God.24 wheels have been affixed to the platform. Each wheel is 9’9” in diameter having 8 spokes. The 24 wheels represent 24 hours and 8 spokes represent 8 prahars (3 hours) of a day. The wheels are so beautifully made and each signifies different prahars. 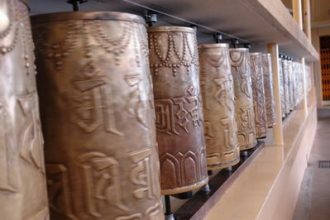 Thus each wheel has different carving depends on the activities performed at the particular prahar. The next art form we saw was the war horse. There are two gorgeous war horses on the southern side of the temple. They are each 10 feet long and 7 feet high. 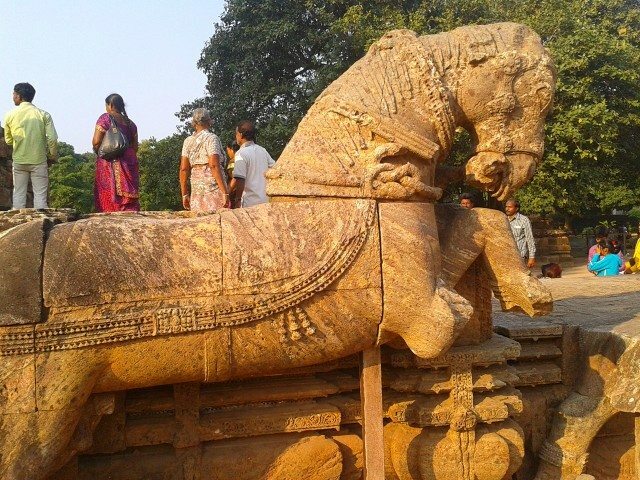 This figure of war horse of Konark has been accepted as the symbol of the state government of Odisha. Then we roam around the temple once again appreciating the work of 1200 architects, who all worked hard for 12 years, utilizing 12 years state revenue to build these 228 feet high majestic structure. We also got our pictures clicked from the photographers present inside the temple complex. 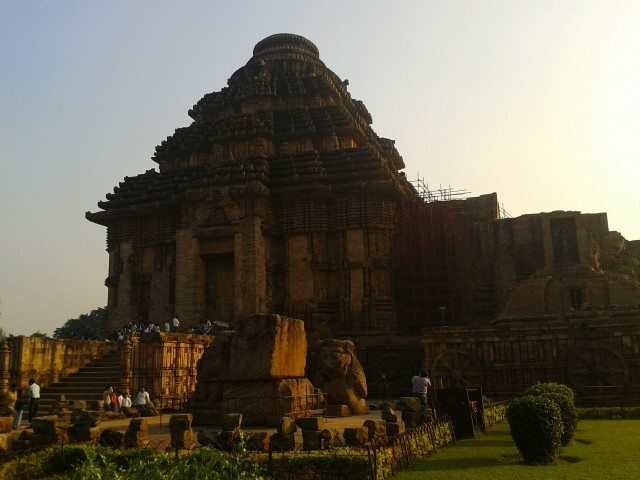 A regards to Konark temple architecture, the temple takes the form of the chariot of Surya (Arka), the Sun God, and is heavily decorated with stone carving.] The entire complex was designed in the form of the God’s huge chariot drawn by seven spirited horses on twelve pairs of exquisitely decorated wheels at its base. The huge wheels carved at the base of the temple are one of the major attractions. The spokes of the wheels serve as sundials and the shadows cast by these can give the precise time of the day. The pyramidal roof soars over 30 m (98 ft) in height. The entrance is guarded by two giant lions, which are each shown crushing a war elephant. Each elephant in turn lies on top of a human body. The temple symbolizes the majestic stride of the Sun God. At the entrance of the temple is a Nata mandir. This is where the temple dancers used to perform dances in homage to the Sun God. All around the temple, there are various floral and geometric patterns. So we happily came out of the temple, took an auto to reach back to car parking. 1700 hrs – We headed towards Puri. Within half an hour we reached at Chandrabagha beach. As we have seen many beaches at and around Chennai, we were not very keen on spending time at the beach. We spend 5-10 minutes at beach and returned to car to reach PURI. On our way we gave call to Dipa da (Panda ji) and he has brought the dry bhog (Prasad) for us. 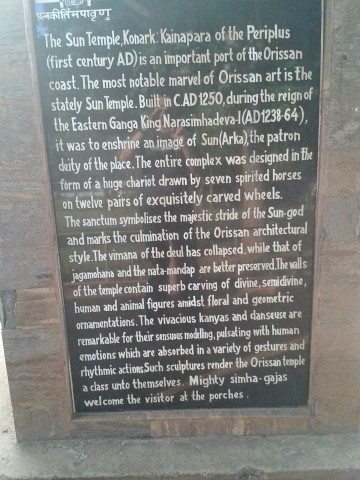 *Post title taken from a famous book on Konark by K.S.Behara. Surprised to see that restoration work is still going on, even after more than a decade of my visit …and I also have a similar photo (three of its sides were covered with massive iron scaffolding) in my album. 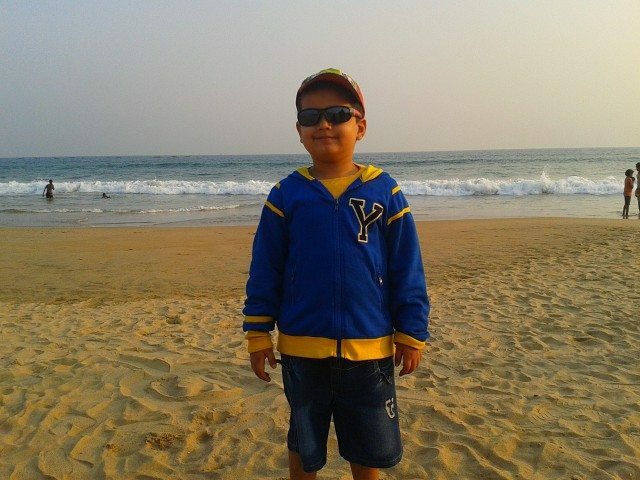 You son is very cute and must have enjoyed a lot. Thanks again for commenting.Its shocked to know that scaffolding was there even 10 years back, may be scaffolding now forms permanent part of temple :).Thanks for compliments from my son side. Good to know about the beach resort. Ah! reminded me of my visit to Puri and Chandrabhaga Beach. Thanks for taking me there again. Thank you Kishan ji. Aapne kitne pate ki baat kahi ghadi ke baare me. 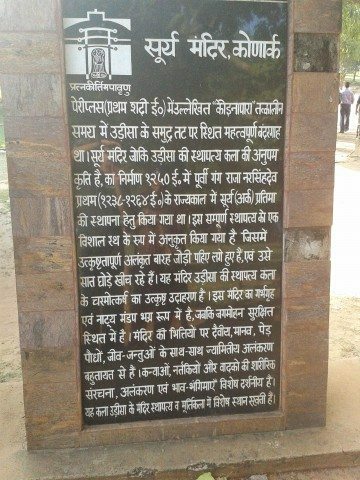 Aisi ghadi jab maine pehli baar jantar mantar Ujjain me dekhi thi to bas dekhti rah gayi thi aur yaad karti thi un Engineer aur Architects ko jin sab ke contribution se itna badhiya structure banaya. 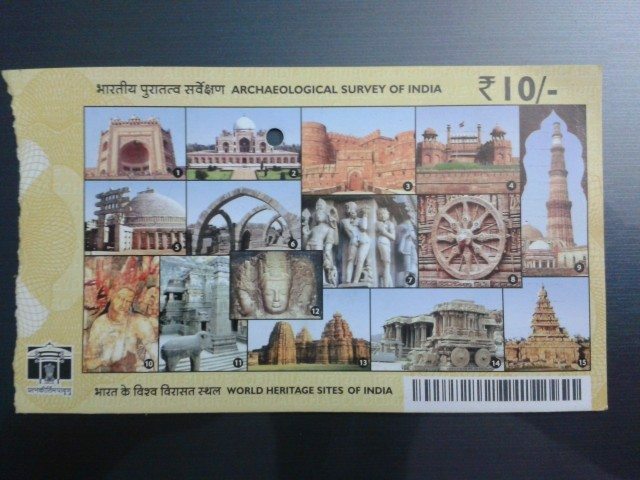 Abhiruchiji, tks for sharing detailed log on this historical place. Thank you SS ji for liking the post and pics. Thanks, Abhee. You definitely crammed in a lot of sightseeing into one day. Some of the pictures look truly awesome. However, I wish you quoted less from Wikipedia and wrote more about your own impressions of this wonderful place. Atlast I got this comment. Was waiting for this comment since long. Even I know I put a lot from wikipedia,but to make post useful for future visitors and to describe about place beautifully I have to seek help from wikipedia. I will tell you one thing. 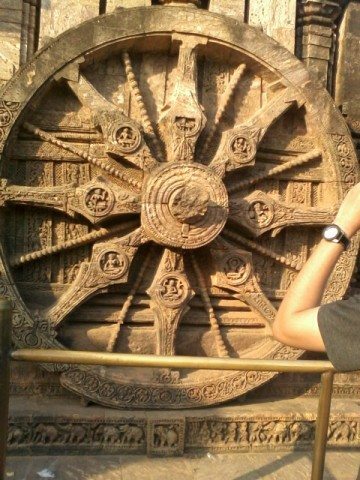 If someone asked me to explain about my Konark visit I will say in this manner ” Acchi jagah hai, wheels acche lage, life me ek baar dekhna chahiye aur mujhe bahut khushi hui waha jaake” :(. So bad description. You must have understood now that How good I am in describing especially when my knowledge in any language vocabulary is very less to write. Still,will try to put my words from my next post. Thanks for kind suggestion. I will be now guilt free to put my own words. Abhee, please don’t sell yourself short. You have ample talent and have displayed it in earlier posts too. In this post too, you have given mentioned that vehicles are not allowed near the Sun Temple and that an autorickshaw ride will cost Rs.40. This is invaluable travel information which we cannot get from wiki. You have also told us that you made the mistake of not hiring a guide and thereby passing on a valuable lesson learnt to future visitors. Later on, you described beautifully the statues of lions at the entrance which found on closer examination to be actually a composite of a lion, and elephant and a human. When writing, we collect information from several sources but we produce something uniquely our own. Just like a bee which collects nectar from many flowers and yet produces a honey which has its own unique taste. Looking forward to many valuable travelogues from you and looking forward to the day when you will be crowned as a Ghumakkar of the Year. Thanks a lot DL sir. Again these pictures were simply beautiful and I loved each of them. The description was clear cut. It is one of the trips where I will take your help when I plan . I am sure you would help me regarding this whenever I go. And yaa , I agree with you as to put as much information as possible on our posts for guiding. But shorten them into few sentences and write more about our feelings and emotions seeing and describing the place as indicated by DL. That also enhances our writing skills and posts becoming more interesting . And yes I would like to say that you are honest enough to admit that you have even used the title from somewhere else. So my respect for grew more on this occasion. 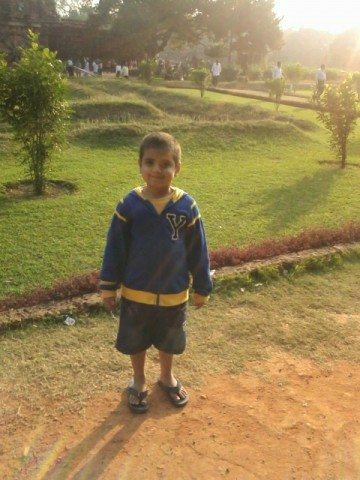 Thanks Vishal ji for liking the post and pictures. Please do plan your trip to this part of India. I will surely give you all information you will be needing for your trip. Thanks again for encouragement and appreciation. A well written detailed post with well clicked pics. You son is really very cute. Travelling with family makes journey even more pleasant. And adding stuff from wikipedia or other sources, to make post more useful is best thing to do, no harm in that. 90% do so. Thanks for liking the post and thanks for compliments from my son . You made the most of the limited time you had at hand. For your next log, I look forward to more notes on your takes on many things. Some of it may required to do some additional reading but in the end it would be tremendously useful and more satisfying to you and everyone. Sure , from next time I will surely give my own words. Nice blog and pics Abheeruchi. I hope to visit this part of the country too some time – sooner rather than later, I hope! In the meantime, will see through your eyes. Thanks Gita for liking the post. After spending time over there, we headed in a steep path downhill (thanks to the knowledge of our taxi driver), and visited a Devi’s temple in the valley below (and there was almost nobody there except for a couple of locals); we rounded off the first day by visiting the war memorial, setup to honor the armed forces.